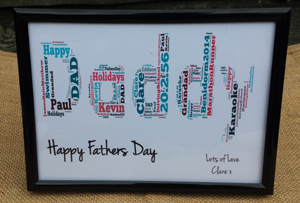 This beautiful handmade personalised Fathers Day ‘Word Art Frame’ for Dads And Grandads makes great gift ideas, and are cool Dad gifts for his Birthday, Father’s Day or any special occasion. Chosen with love for your DAD or your children’s Dad.. Personalised frames make great gifts for new Dads for his Birthday’s, Fathers Day or even just to say Thank You for being there for you. If you are looking for a gift that is unique, then this Word Art frame is an awesome option. Note: Please confirm whether you want a proof sent to you. If you don’t confirm within 24hours, we will post out . If you have asked for a proof this must be approved before we send the print/frame out to you. All our products are handmade therefore may differ slightly than those shown in the picture. Embellishments may vary. Please note: Image colours may show up differently on Mobile Devices. This personalised print Word Art measures 13 x 18cm approx. Write your Words for your Picture WordArt. Please separate each set of words with a comma E.g. Dad,Best Friend, etc. Is your Dad celebrating his first Father’s Day? Then gifts for new Dads like this Word Art frame would be the perfect gift for your Daddy this Father’s Day! Let your Dad know how much you appreciate him! 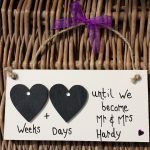 Have a look at our product range and choose a personalised plaque for your Dad on his very special occasion. Get your “I Love You Daddy” personalised plaque for this Fathers Day or any other special occasion this year! Your Dad will love being reminded how special he really is! Personalised plaques made at MadeAt94 make great gift ideas for Dad on this Father’s Day or any special occasion this year! Say I love you with this special “Happy Fathers Day Daddy” personalised frame today! This word art frame reads “Happy Fathers Day Daddy”. Note: Daddy can be replaced with any name you require, for example: Dad, Grandad.